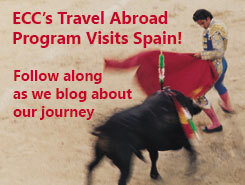 Welcome to our ECC Travel Abroad – Spain blog! We are glad that you are taking time out of your busy schedule to share some time with us as we travel around Spain. Daily, Dr. Lamm, Roberta Cashwell, or I will update you on the themes and sites of the day. We are scheduled to depart for Spain this Friday, March 16, 2012 and return on Sunday, March 25, 2012. Along the way, we will visit Madrid, Toledo, Granada, the Costa del Sol, and Seville. The forecast during our travels is expected to be in the mid-to-high sixties with only a few scattered showers, so we are looking forward to great sightseeing weather.